Supreme Court Case Tests Status Of Jerusalem Can U.S. citizens born in Jerusalem list Israel as their place of birth on their passports? A 12-year-old boy is contesting the U.S. position that no one has sovereignty over the city. 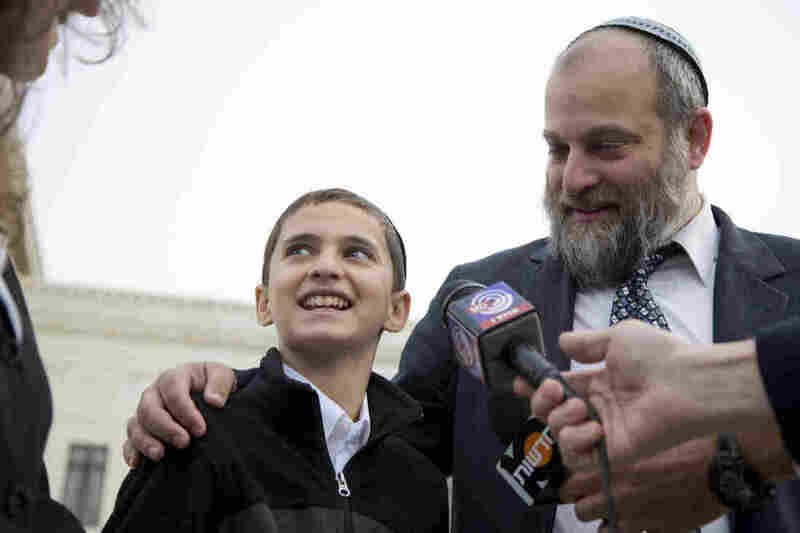 Menachem Zivotofsky and his father, Ari Zivotofsky, gather to speak to media outside the Supreme Court in Washington on Monday. The court is taking its second look at a dispute over the wording of U.S. passports for Americans born in Jerusalem, a case with potential foreign policy implications. The U.S. Supreme Court heard arguments on Monday in a case testing whether American citizens born in Jerusalem can list Israel as their place of birth on their passports. It might sound like an academic question, but the status of Jerusalem is at the heart of the Arab-Israeli conflict in the Middle East. Ever since the founding of Israel, the U.S. has taken the position that no country has sovereignty over Jerusalem until its status is negotiated in a Middle East peace deal. Israel's supporters in Congress, however, have tried to force a different policy, seeking to move the U.S. Embassy from Tel Aviv to Jerusalem and mandating that the U.S. Department of State allow U.S. citizens born in Jerusalem to list Israel as their place of birth. Presidents George W. Bush and Barack Obama, however, have refused to comply with the passport mandate, contending it infringes on the president's foreign policy powers. Challenging that position is a 12-year-old boy named Menachem Zivotofsky, born in Jerusalem to American parents who emigrated to Israel and maintain dual citizenship. He and his parents want his passport to say he was born in Israel, not Jerusalem. "I'm an Israeli, and I want people to know that I'm glad that I'm an Israeli," the young Zivotofsky said Monday on the steps of the Supreme Court. Inside the Supreme Court chamber, it was a weird day from the get-go. The hands on the clock were so out of whack that at one point, they were literally spinning. And when the justices walked to their places on the bench, Justice Sonia Sotomayor had to move aside Justice Stephen Breyer, who was about to sit in her seat by mistake. It was an omen of an even stranger argument. The court's most conservative members, all of whom made their professional bones in Republican administrations aggressively advocating for executive power, seemed now quite hostile to executive powers that date back to George Washington's time. And the court's three Jewish justices seemed pretty unsympathetic to the Jewish plaintiffs. Representing the Zivotofskys, lawyer Alyza Lewin argued that identifying an American citizen born in Jerusalem as born in Israel does not mean the U.S. is recognizing Jerusalem as part of Israel. It simply recognizes a choice of identity made by an individual. Justice Elena Kagan was skeptical, noting that such a choice is not available to anyone else in the world — not to citizens of Northern Ireland who might want to list their place of birth as Ireland, and not even to Palestinians born after 1948 in Jerusalem who might want to list Palestine as their place of birth. This, she opined, "is a rather selective vanity plate law." Justice Anthony Kennedy repeatedly suggested that the way to avoid the recognition problem could be for the State Department to put a disclaimer on the passport saying the United States is not recognizing Jerusalem as part of Israel. But in response to a question, Zivotofsky's lawyer acknowledged that such a disclaimer could be voided by Congress. The most hostile questioning of the day was aimed at the government's advocate, Solicitor General Donald Verrilli, who sought to convince the court that upholding the passport mandate would undermine the president's foreign policy power, particularly the executive power to recognize foreign governments. If this statute was such a "big deal," Chief Justice John Roberts asked, why did President Bush sign it? Verrilli noted that President Bush signed the giant foreign aid measure to which the passport language was attached but issued a statement saying he would not enforce the provision. Even with that caveat, Verrilli observed, the signing provoked massive demonstrations in Jerusalem, some turning violent, and the Palestinian Parliament voted for the first time to declare Jerusalem the capital of the Palestinian state. Chief Justice Roberts responded, "That's partly because the executive branch made such a big deal out of it" by litigating the question instead of just "moving on." Verrilli, seeking to illustrate why passports are so integral to foreign policy, noted that if the U.S. were to start issuing passports to people born in Crimea who identified Russia as their country of birth, that too would contradict American foreign policy. That, he said, is why recognition of foreign countries "is not lawmaking; it is an executive function" under the Constitution. Justice Antonin Scalia interjected that "war-making is an executive function, too." Verrilli replied that when the framers wrote the Constitution, they put in a "specific role" for Congress in declaring war, but "did not provide a comparable role with respect to recognition decisions." It's important for the court to understand, the solicitor general said, that a decision upholding the passport mandate would pose a serious risk to the nation's credibility. "Why would that be so?" Justice Samuel Alito interrupted. "No matter how this court decides, everyone will know what the position of the president is." It won't be "just one branch" of the U.S. government calling Jerusalem part of Israel, Verrilli responded. It will be two branches. And because that is contrary to the long-held position of the United States, the nation's credibility as an honest broker will be "called into question." Moments later, Justice Kagan had this caustic observation about some of the questions posed by her colleagues: "This seems a particularly unfortunate week to be making this kind of, 'Oh, it's no big deal' argument. History suggests that everything is a big deal with respect to the status of Jerusalem." Right now, she continued, the city is a "tinderbox" because access was for a time cut off to a particular holy site there. When it comes to questions involving every aspect of Jerusalem," she said, "everything matters, doesn't it?"